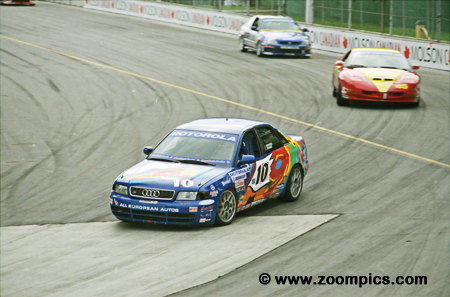 Most of the races during the 2000 season were 3-hours in length – Toronto would be an exception at 1-hour 40-minutes. This would force teams to rethink their usual race strategies while contending with the challenges and complications of a 52-car field on an eleven-turn 1.755-mile track. 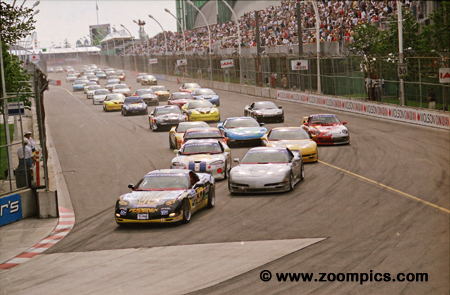 Toronto’s Exhibition Place and fifty-two cars follow the pole-winning No. 37 Chevrolet Corvette shared by Paolo Dal Cin and John Heinricy into turn one. Immediately behind them are the No. 22 Corvette of Mike Fitzgerald and Michael Culver and the Dodge Viper of David Amick and Joe Varde. 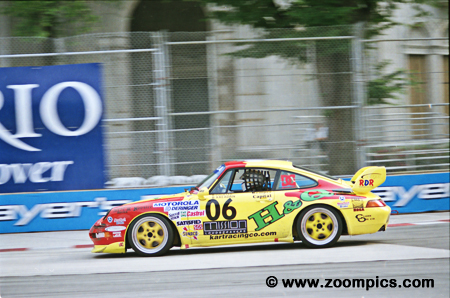 The Porsche 911 Turbo driven by Richard Spenard and Jean-Francois Dumoulin was the fastest qualifier, however, they started fiftieth in a field of fifty-two cars. During qualifying, Dumoulin ignored a black flag for a wrecker on the course which led to the penalty. That did not deter the pair as they carved their way through the field to capture the win by 5.2-seconds. Sport Touring class winners Howie Liebengood and Andy Lally finished an amazing ninth overall. This was their second class win of the season in the Competition Preparation BMW 328 – their first being Mid-Ohio. 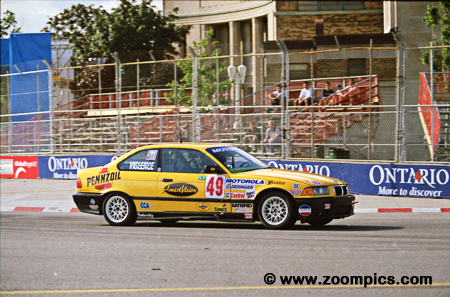 The pair also won their category at Toronto in 1999. The No. 69 HART Honda Civic Si qualified second in the C2K - here it follows the No. 41 Acura Integra GSR of the Nonnamaker brothers. 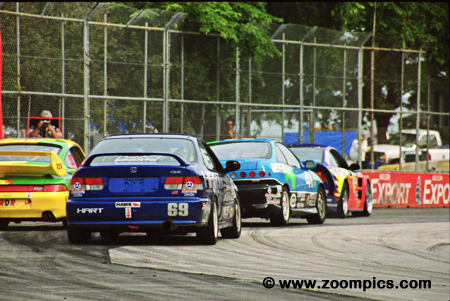 Peter Halsmer and Bryan Johnson in the HART Civic would finish second in class but the brothers would lose the left front wheel – hit the wall and finish well down the order. The Team Hurricane Audi S4 qualified tenth in the Grand Sport category and forty-fourth overall. But drivers John Bourassa and Lance Stewart had an excellent race and were able to move through the field. They finished ninth overall and third in class. Phoenix American Motorsports entered Paolo Dal Cin in two cars - the No. 32 Grand Sport class Pontiac Firebird with John Yarosz and with John Heinricy in the Super Grand Sport Corvette. Dal Cin’s best result came in the Firebird where he and Yarosz finished second in class. 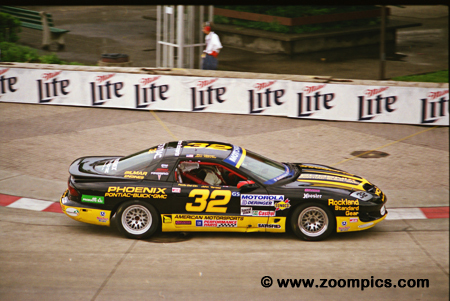 With the disqualification of the Kent Motorsports Pontiac Firebird, the No. 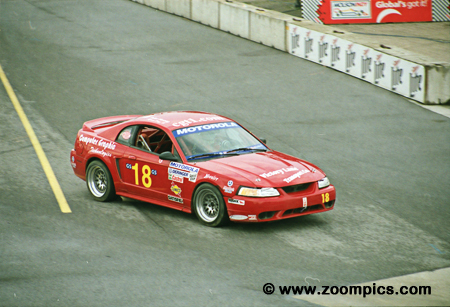 18 Anaconda Racing Ford Mustang Cobra R driven by Peter Herzog and Alfonso Diaz Jr. inherited the Grand Sport win. However, they were penalized 60-seconds for making a pit stop when the pits were closed which dropped them to third in class. 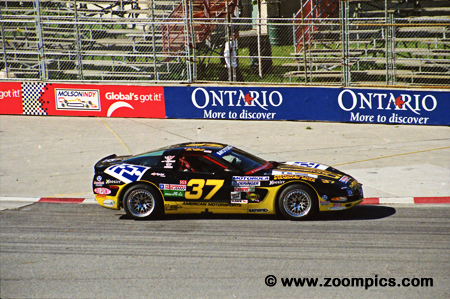 Peter Schwartzott won the Touring race at Toronto in 1999 and in 2000 he captured third in the Sport Touring class. Schwartzott’s co-driver at this event was Paul Gargiulo. The pair shared the No. 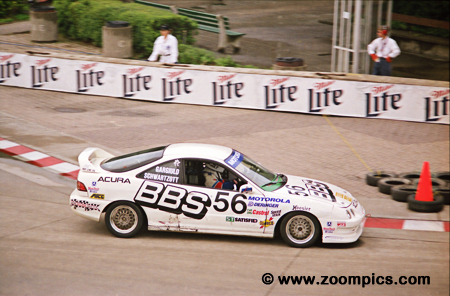 56 Thornley Racing Acura Integra Type R.
The No. 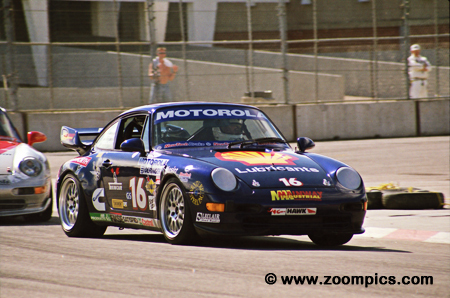 16 Grand Sport class Porsche 993 was driven by Al Wortzman and Mike McClamont. These local drivers entered the event with a 7-point lead in the class standings. They finished sixth in Grand Sports but this was much better than the team chasing them in the points - Sam and Brett Shanaman retired after 7-laps. 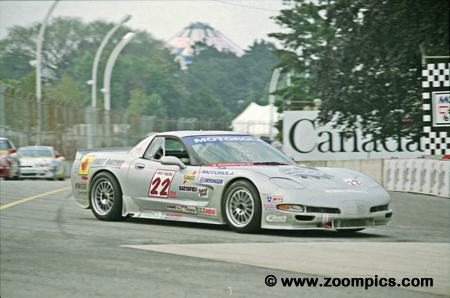 Street courses are rarely forgiving and this was the case for the Planet Earth Motorsports Chevrolet Corvette shared by Joe Nonnamaker and Bill Pate. The crew was successful in repairing the car and the seventh place starters made a last lap move to take fifth overall and in SGS by less than a car length. It was a difficult season for the Phoenix American Motorsports Chevrolet Corvette. The car would often start at the front of the grid only to encounter problems during the race. 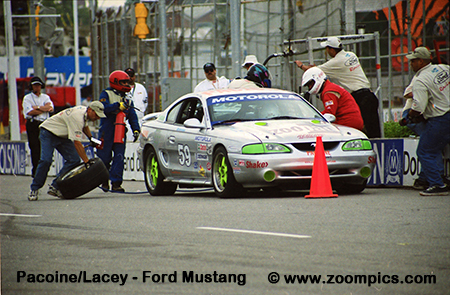 Toronto was to be one of these difficult races as Paulo Dal Cin and John Heinricy retired on lap-10 with transmission issues. The No. 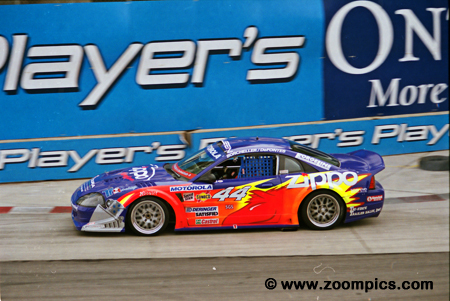 44 TF Racing Saleen SR captured the final position on the Super Grand Sport podium. The car was driven by Terry Borcheller and Michael DeFontes. They did not record a qualifying time and had to start at the back of the grid, which made their finishing position quite remarkable. Qualifying second in the Sport Touring class were Mike Van Sicklen and Bob Endicott. 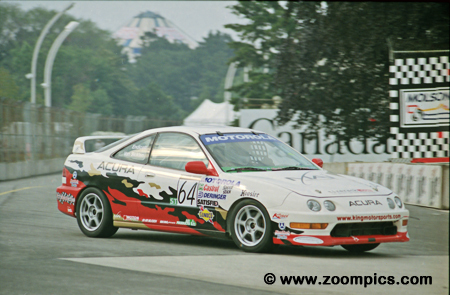 Unfortunately, the Acura Integra Type R only completed seven laps before retiring. They were classified as forty-eighth overall and tenth in class. Californians Rudy Courtade and Bryant Kreadan started twenty-ninth overall and eleventh in the Super Grand Sport category. 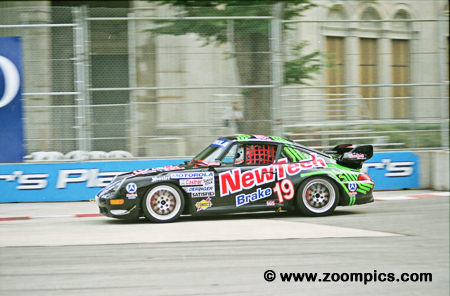 They were able to move their Porsche 993 Super through the field to an eighth place finish in class.